A couple of years ago, I became overly consumed with the web series Awkward Black Girl. All it took was watching one episode and it was a done deal – I was an instant fan. The series followed the awkward life of J, played by comedic super genius Issa Rae. I enjoyed the quirkiness of her character along with the rest of the talented supporting cast. The series really picked up for me when they introduced the love triangle plot between J, White Jay and Fred. Ultimately, J chose White Jay, whom I liked, but there was something about Fred. He was cute, shy, but could be assertive when need be. I secretly wanted J to get with him (okay, I wanted to get with him! ), but it never happened. Sadly the series came to an end and I no longer got to see Fred’s beautiful smile. Five days later we conducted a phone interview and I got to learn more about what he’s been up to since the series ended. He is currently working on Where is the Love – a podcast that delves into modern dating and exposes what men and women like and hate about dating. I’ve listened to several episodes, and let me tell y’all, discussions are candid and get quite real! Not sure if it was Madison’s charm or cool LA accent, but he made it easy for me to share with him an EMBARRASSING story about a first date. Not sure if it will wind up on his podcast, but I had to tell yet another person about my epic fail of a first date. Lol! Interested in knowing more about his podcast and what it was like working on Awkward Black Girl? Keep reading. Fun Fact: He can seduce you with his guitar skills! 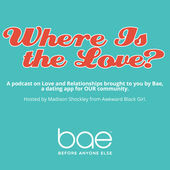 What is the “Where is the Love” podcast? It is a social experiment. The idea for the podcast came from me wanting to let the audience be a fly on the wall while I have candid conversations about dating and relationships. Conversation with men and women, so that listeners can get both perspectives and become enlightened on how people think about different issues. I feel like when men are in a room together, we have guy talk, and when women are together they have girl talk. We don’t share those ideas across the sexes. Came up with the idea with my producer who is my friend – MJ Jackson. We created the show together. It all spawned from a conversation we were having about dating on Tinder. She told me about the things that annoy her about using Tinder – the stuff that guys do and I told her what annoys me. We were sharing our stories back and forth and then we were like, “ Yo, we gotta survey our friends and see what people do that is really annoying and makes you not wanna date. That sparked the original idea. So we created a podcast around that. Who did you create the podcast for? It’s for anybody who’s trying to find love. For young people who are starting to explore dating, to older people who may have been married and are divorced and wanna get back into the dating market. Ultimately, my goal is to help people understand how to better approach relationships so that they can end up in a fulfilling, loving relationship. What are your goals for the podcast? I want a lot of people to experience the podcast and create this conversation. I want the podcast to bring communication across the lines. After the second season, I’m going to write a book based on all the things I learned from the first and second season. Also the next season will be video. Being a huge fan of Awkward Black Girl, I had to ask Madison about his time filming the web series. What was the experience like being on Awkward Black Girl? It was really exciting to work with a group of such talented young people of colour. I think we had an incredibly gifted group of people that came together to work on it in the spirit of harmony. Which allowed it to become a powerful thing. It felt special to be surrounded by such smart and capable people who were willing to invest some of their free time to work with each other. Although this convo went waay past my bedtime (I need my beauty sleep! ), I loved talking about relationships and getting the male point of view on a few situations. Madison was extremely easy to talk to, and even gave his opinion on a few of my past dates. Thanks for the advice and for the chat, Madison!